Q- What is your minimum order policy? A- Our minimum order for cake pops and cupcakes is 2 dozen with the exception of special holidays where we may offer gift basket or buckets pre-made (bakers choice). Our minimum total order is $100. We appreciate your understanding! A- We accept cash, debit, and credit cards, and payments through Zelle and Venmo. Invoices are sent through square. A- Yes! Schedule permitting, we can deliver when needed on Fridays, Saturdays, and Sundays. A one hour window for delivery must be scheduled at the time of your order. Delivery within Anthem is $5. We do deliver throughout the greater Phoenix & Scottsdale areas when the schedule permits, but please be advised that the delivery fee will apply and starts at $30 per hour (round trip total is calculated) to the Phoenix/Scottsdale/Glendale area. If you are ordering a large or tiered cake or other display from us, we strongly suggest you invest in delivery to insure that everything is perfect for your special occasion. Once a cake or other dessert has been picked up by you, we are not liable for any accidental damage that may occur, and do not give refunds for damaged incurred after the cake leaves our kitchen. The small delivery fee is certainly worth saving the stress of driving with, carrying and setting up larger cake displays. We are happy to take this task off of your hands at minimal added cost to you! For gift deliveries, we will only attempt delivery one time to any address provided by you within a 3 hour time frame agreed upon. If no one is available to accept the delivery, it is up to you to pick up your order. Refunds will not be given for inability to make delivery or for orders that are not picked up. A- Because we are a very small business we take on a limited number of orders to insure the best quality and time spent for each customer. For this reason, we will invoice you once all of your order details have been finalized. Payment is due in full on the invoice due date to avoid order cancellation. A hold deposit is required to secure your date is not given to another client. This deposit is due at the time of booking and is $30 or 30% of your total order- whichever is greater. Hold deposits are NON-REFUNDABLE. All unpaid invoices will be automatically canceled the day after they are due. We may not always be able to call or text you to remind you about your payment. We send out a reminder email on the due date, and then the invoice is cancelled if not paid within 24 hours of the reminder. A- Because we take a limited number of orders per week, it is best to place your order as early as you can to guarantee that you can be accommodated. We recommend at least 3 weeks in advance on average. Last minute requests, and rush orders (less than one week before pickup/delivery) will be subject to a $15 or 15% rush fee (whichever is greater). Many times we have to turn away clients who wait until the last minute because we are completely booked, especially during holidays and wedding season. Q- What is your Payment & Refund Policy? A- When we make room in the schedule for your order, we are closing that space off to another potential customer. All invoices are pay in full when due. Of the total, 50% is considered a NON-REFUNDABLE deposit. In the event of a cancellation, (with 10 days or more notice), we will offer to apply your deposit portion toward a future order and provide a refund for the other 50%. 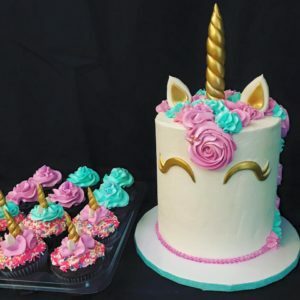 On custom orders where specific materials, ingredients, logos, or other custom items specific to your cake have already been ordered and paid for by us, receipts will be provided and the amount will be deducted before any refund is given in the event of a cancellation. Q- Do you have gift cards available? Yes! We do offer gift cards for purchase in amounts ranging from $25-$100. When paying with gift card payments, our minimum order is still $100. If you are paying with a Hidden Gem gift card, please let us know this when placing your order as this payment has to be applied separately due to squares processing procedures. Any remaining balance will be sent on a separate invoice and is due 10 days prior to your event date. At Hidden Gem Cakes we aim to give you a 5 star experience with every order. We are confident in the taste and quality of our baked goods and want to keep you coming back for more! Please keep in mind that refunds are not given for reasons such as last minute event cancellations, cakes that are damaged after acceptance and pickup, or for non pickup. In the rare event that there is a problem with an item ordered, you may choose not to accept the item and forfeit your deposit. If you do accept your dessert and something is wrong once you have left the kitchen, please call us right away and return your dessert so that we can correct the error or issue a refund. Client satisfaction and making amazing treats is our top priority! A- We do not give discounts on bulk orders, Please like and follow us on Facebook and Instagram for information on special pricing, monthly giveaways, and other opportunities for discounts. Hidden Gem Cakes is proud to have personally selected local non-profit organizations that we currently work with and donate to. We have chosen organizations that are near and dear to our hearts, and that are proven and established in the community. We currently donate to animal rescues, and to our neighborhood school district. We are no longer accepting new requests for charitable donations. If this changes, it will be updated.